Mother`s milk is like a “magic potion” that has a significant effect on baby’s immune system and development. It also represents the best way for a mother to transmit her love to the baby, to bond and to soothe him. When a baby is born prematurely, a lot of these things change. The mother does not have the opportunity to put her baby to the breast, but instead, the baby is fed through a tube with a syringe. In my case, soon after Aurora and Victoria were born, I was given a syringe and asked to express by hand. I did not understand why it was like that, so I asked, and the midwife told me that in the first days after delivery, the quantity of milk is minimal. Therefore, expressing with a pump might make the precious drops colostrum, rich in vitamins and minerals, to get lost in the tubing of the expressing kit. I followed the instructions, and I regularly expressed to stimulate the lactation. Some moms with premature births might struggle because their body is still not ready for this step. Expressing by the pump was such hard work. It was sorrowful not to have the girls at my chest. So what I did, was to take something that belonged to them, a muslin for example, and had it close during the expressing sessions. That was helping to stimulate the milk production. Some moms might try to look at the pictures with their babies. I was not able. Whenever I tried, I ended up crying seeing them so little and sick. 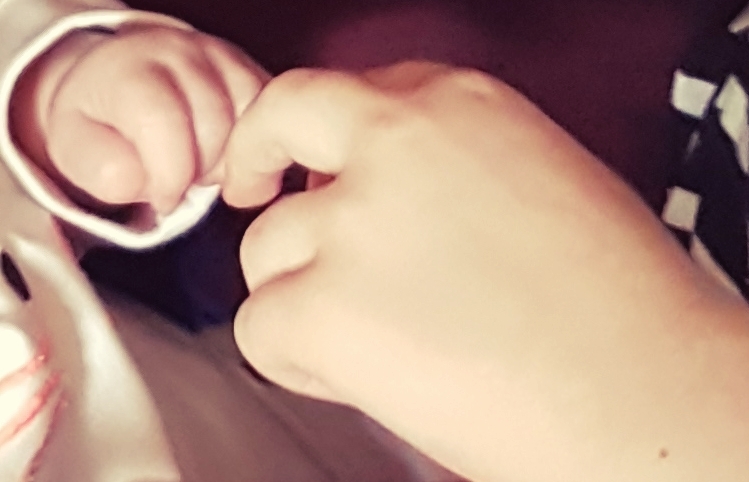 To be able to feed himself, a baby needs to synchronise the sucking, swallowing and breathing. This happens after week 32 of gestation and even later if the infant is facing breathing issues. Aurora and Victoria were fed by UVC and IV in the first days, and OG and NG tubes, once they were able to receive the milk I was expressing for them. It took a long time for them to have the tube out due to the respiratory support they needed. Victoria being fed by UVC and IV in the first days. At UCLH, I use to express in the expressing room. There was space for four moms at a time, and usually, we use to share our stories and struggles and encourage each other. More common questions were: ”At how many weeks was your baby born?”, ”Do you have other kids?”, ”What do you do to produce milk?”, ”For how long are you in NICU?”. All the expressing kits were for one use only. That was to reduce the spread of possible infections. The pump was cleaned before and after use by the moms, and every day by the staff of the hospital. Nonrecyclable bottles were provided, and the milk was kept in the hospital’s fridge, labelled with the name and the expressing date and hour. The nurses use to keep the amount of fluid necessary to feed the babies in the refrigerator that was in the nursery, and the rest of the amount was stocked in the freezer. Once transferred to Whittington Hospital, Aurora and Victoria were put in the isolation room because of the virus they had, CMV. I use to express in the same place. There was a pump only for me and bottles at discretion. Also, I had the opportunity to sterilise the kits. At home, I expressed with a manual pump, filling the bottles from the hospital. Because I had much milk, I use to put it in the freezer. The bottles were taking much space, and I also used the milk bags, easy to find in any pharmacy. The milk can stay frozen for six months at home, and three months at the hospital. I manage to produce it for almost, four months, for both Aurora and Victoria. Maybe I could do more, but travelling to the hospital, being under pressure and stressed all the time, waking up during the night, use to make me lose weight, energy and I became exhausted. After the girls had all my milk, they had the formula. From the very beginning, they did not tolerate it well, so the team that took care of them changed many types of milk, until the dietitian decided they should have the amino acid formula. It is a kind of milk with very broken proteins, usually given in cases of allergy to cow’s milk. It has a horrible taste and smell. After they were one year old, we gradually changed the PURAMINO with a goats milk formula, called NANNYCARE. Initially to number 1, and after, number 2 and they still consuming it. I can not stress enough the importance of mother’s milk for a baby, moreover, for a premature infant. Preemies do not have a strong enough digestive system to tolerate the formula. Mom’s milk is easy to digest, protects the baby against bacterias and infections and makes him thrive better than any other food or supplement in the world.